Although it was printed anonymously in 1885, Lafcadio Hearn is generally accepted as the author of La Cuisine Creole. In his introduction, Hearn describes the intriguing origin of this unique cuisine, explaining that, ';it partakes of the nature of its birthplaceNew Orleanswhich is cosmopolitan in its nature, blending the characteristics of the American, French, Spanish, Italian, West Indian and M… exican . . . There are also obvious influences from Native Americans, African Americans, and others in the American melting pot.' Among the ';many original recipes and other valuable ones heretofore unpublished' included in the book are Gombo file, Bouille-abaisse, Courtbouillon, Jambolaya, Salade a la Russe, Bisque of Gray-fish a la Creole, Pousse Cafe, Cafe brule, Okra Gombo, Grenouilles Frites, Pain Perdu, Sangaree, and a marvelous collection of fish, seafood, and game recipes. 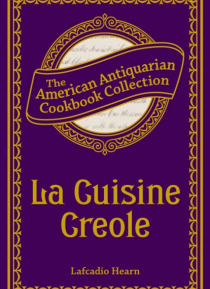 There are also instructions on ';The Service of Wine' and a large number of recipes for drinks and cocktails.This edition of La Cuisine Creole by Lafcadio Hearn was reproduced by permission from the volume in the collection of the American Antiquarian Society, Worcester, Massachusetts. Founded in 1812 by Isaiah Thomas, a Revolutionary War patriot and successful printer and publisher, the Society is a research library documenting the life of Americans from the colonial era through 1876. The Society collects, preserves, and makes available as complete a record as possible of the printed materials from the early American experience. The cookbook collection includes approximately 1,100 volumes.